If you think that your wedding day is going to go off without a hitch, I hate to say it... but you're wrong. There will definitely be bumps and bruises along the way. However, if you're anything like me, sometimes imagining the worst possible scenario can help prepare you for all the little (and big) fails that are bound to occur. 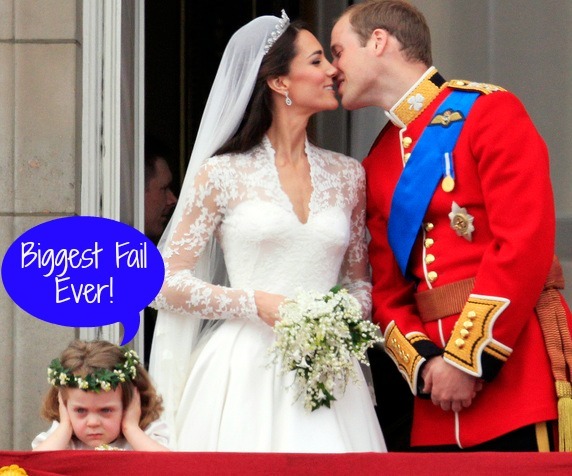 I've ranked my wedding fails below in order to relieve you of some anxiety. Weddings are filled with exciting moments. One of the most exciting moments for your guests is the bouquet toss. It seems to bring out the best and the worst in people. I was looking forward to this tradition as I knew there were quite a few couples who were likely to get engaged over the next few months. I sent word to a few of my bridesmaids to scatter in order for one particular friend to catch the bouquet. The music began, the girls hearts began to race, and toss. I turn around to see my husband's 8 year old cousin taking a dive for the bouquet. Despite my frustration at this well-planned scheme going awry I managed to remember just how much a little girl's heart tends to flutter at the idea of one day getting married. Plus, it made for a good story later. As the big moment came closer and closer I felt my stomach growing tighter and tighter. Every minute that pushed closer to the ceremony left me feeling more and more nervous. As the bridesmaids and groomsmen surrounded me to guard me like a football team, I continued to feel my anxiety rise. The moment drew closer, couple after couple began walking down the aisle, and then I noticed. The processional music hadn't started. The music being played was some instrumental completely unknown to me. Finally, right before my maid of honor made her debut "A Thousand Years" began. I then expressed to the guys waiting to open the doors that my entrance was still a while away, at which the wedding coordinator looked at me concerned and said "How long?" As if another 30 seconds would set the entire timeline out of whack. So instead of waiting for the remarkable moment when the male voice chimes in, I let the guys know to open the doors during the chorus, and I began making my way down the aisle. The truth is I had been dreaming about walking down the aisle at a precise moment in that song for the last 2 years (way before my husband and I were even dating). The misstep in music was frustrating, but it was enough of a distraction to keep me from having a major meltdown. As I stood below a giant oak listening to a good friend recite scripture, I couldn't help but notice that the first row on my husband's side looked a little empty. On the far left of the aisle sat his mother and his father. Four seats to their right sat our friend who was currently out of his seat for the reading. Then, I noticed in the row behind his parents sat his grandmother and grandfather who had driven 36 hours to come to the wedding. My mother and I had strategically counted and labeled rows to make sure that all of the immediate family was seated in the first row. I don't know if one of the family members was unaware of this etiquette, or if they misread the "Reserved" sign as "not for you." Either way I hated that his grandparents were even 1 row further than they were supposed to be. There was not remedy for this situation, and none of his family members ever brought it up, so I just assumed that there were no hurt feelings amongst the confusion. The next fail is not so much a mistake on my part, but simply one of the negative effects of getting married. If you've already started the process of planning for your wedding, you know that one of the most tedious and most important tasks is to complete a guest list. There are always those guests that you know that you have to include and there are those that you won't be able to include even though you want to. In this case, one of the no brainer guests was my paternal grandparents. They are my only living grandparents, and I thought it important to invite them. Despite it being an obvious choice I recognized that inviting them was not easy. My grandparents and I had been somewhat estranged since I went away to college. My grandmother called infrequently and often had few kind remarks. As a young person I found this difficult, and at one point I stopped answering her calls. After that I never really reconnected, and neither of us took the initiative. Piles of RSVP's slowly started to come in, and I was somewhat surprised to see that my grandparents had declined. I had at least expected an explanation, but they left none. Even my brother (who lives on their property) was surprised when he realized they hadn't come to the wedding. In the end, I think the situation hurt my mother and my husband more than it hurt me. It was a disappointing realization, but certainly did not have a lasting impact on the celebration. My biggest wedding fail coincides with my biggest blond moment ever. The worst part is I did it twice. Our final "A" guest list (the people you have to invite before you can add more) totaled 250 guests. It was the largest amount that our venue could hold. My husband, my mom (aka wedding planner), and I referred to this number over and over again when making our invite list. It was so engrained in our brains that when we went to order invitations I told myself I needed at least 250 (plus a few extras incase we got to the B list). When in reality the amount of invitations I needed was closer to 100 as most of our guests were couples and families who lived in the same household. Somehow, I had managed to miss this despite spreadsheet after spreadsheet. When invites came in and we began the labeling process, I immediately realized my mistake. My mother and I confirmed the dilemma, gave a shoulder shrug, and moved on. It ended up working out because many of our invitations got lost in the mail and new ones had to be sent. Nonetheless, you'd think once would be enough. I unfortunately ended up doing the same thing with rehearsal dinner invites. Thankfully, the number was not as high, but since I had handmade these invites it did make the mistake a bit more frustrating. So there you have it, my biggest wedding fails. There are certainly worst things that could happen, but hopefully your big day will go much more smoothly if you prepare. Tell me about your biggest wedding fail or your biggest wedding fear in the comments below.